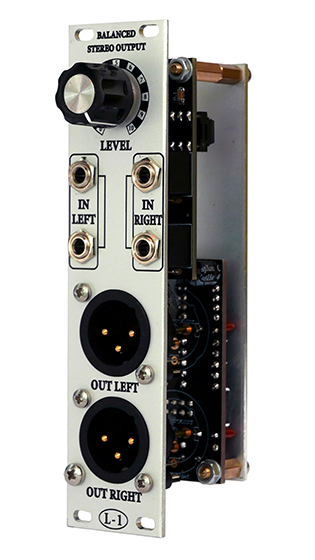 MUFF WIGGLER :: View topic - [IN STOCK] L-1 XLR Balanced Outputs - Eurorack kit / module. 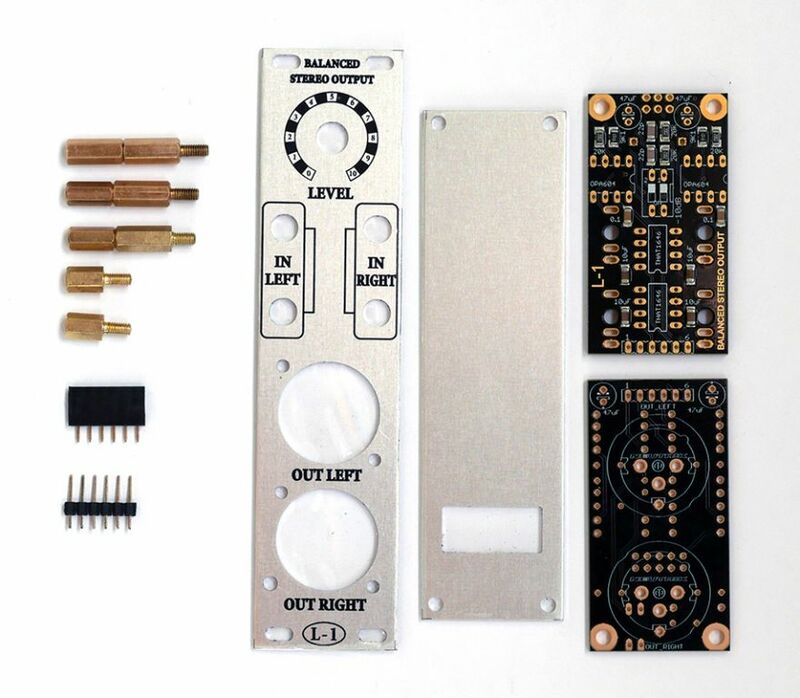 [IN STOCK] L-1 XLR Balanced Outputs - Eurorack kit / module. I made XLR Balanced Stereo Output -- Eurorack kit / module. Based on THAT1646 Balanced Line Driver. Schematic? I see you have 10uF on the board next to the balanced out drivers, but those should be 10uF bipolar caps, preferrably good ones (if they are the caps in the sense lines). 10uF capacitors must be non-polarized according to the THAT1646 datasheet. Offset removing capacitors are 47uF electrolyths. (at the top of the board). It's easier if you just post your schematic, not the one from the datasheet, not sure why this is not done more often. You recreate a schematic first, before laying out a board right? But, if I understand correctly, your board has 47uF BP in the sense lines of that IC? Or are they indeed those 10uF SMT caps (which could work as well, I suppose)? Also, there are a few pin compatible alternatives for 1646, and not all of those need the caps in the sense lines, I included them in my builds, figuring I could bypass them if not needed. Same goes for resistors in series with the outputs and to ground. These help in making sure the output IC "sees" about 600r, which is it's intended use, in practice, most inputs have a much higher input impedance these days. By the way, not sure if anyone knows a solution, but these balanced line driver IC's do have a habit of dying if someone leaves phantom power on. I wonder how to solve this, I hope the series resistors I added help in this regard (add zener diodes on outputs, maybe?). 10uF SMT are in sense lines. 47uF polarized electrolyths are at the input. Diodes are protection against phantom power. Ah, now I understand, looks good. 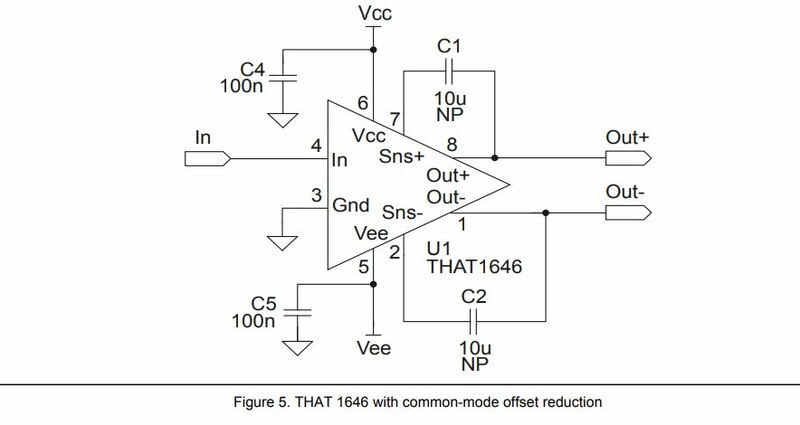 I think you will need a return path to ground somewhere between that DC blocking cap on the input and the input of the driver IC though, but maybe someone more knowledgeable can chime in. Nifty way of compensating for differences in component height too. I experimented with isolating transformers. Wanted to make a possibility to optional install them. I used hi-quality Neutrik NTL-1. But I found no advantage of using them at the output against ground-loop hum. Because there no hum if to use a single case and PSU. A 100Hz ground-loop hum appears if to connect another case with separate PSU. So I decided to make that possibility to install optional isolating transformer at the input. I plan to make XLR inputs module where will be a transformer option. But need to make an experiment how it will be effective though. For inputs, I think you are right, good transformers are better, maybe a microphone preamp based on API or Neve preamps? Voltages aren't that different for API (Neve is single ended PSU, at least the older class A stuff). Excuse the newbie question but why two inputs? And shouldn't there be a couple of resistors on these to stop two connected inputs fighting? I think that these are not supposed to be two Inputs, but an Input multed through so you can take the signal OUT again? for example you could route the signals to this output module, take the "through" multed signals and route them to a headphone amp module? that would explain why there is no circuitry to mix these together or prevent them from "fighting"
You are right. These are multiples to use a signal further. Not two separate inputs. For example I use two XLR out modules - one for a speakers, another for record, and further into Phones module. One power diode (1N4004?) to each rail for each of the outputs. Details are in the THAT 1606 / 1646 data sheet. Yes, there made this way, in the module. AHHH I got it. Great feature. Thanks for the explanation!